Are you asking yourself, can I make money from affiliate marketing? Are you about to dive into this product head-first with the dream of becoming an overnight millionaire. There are a few things you need to know about products like this before you jump in. They are not always what they seem. You can make money from affiliate marketing but this may not be the product that will do it for you. I can tell you that I am a bit skeptical of this product right from the get-go because I know that done-for-you products usually only make money for the owner and not for the Affiliates. As I go through this product it seems to be just like hundreds of others that don’t give any value for your money. 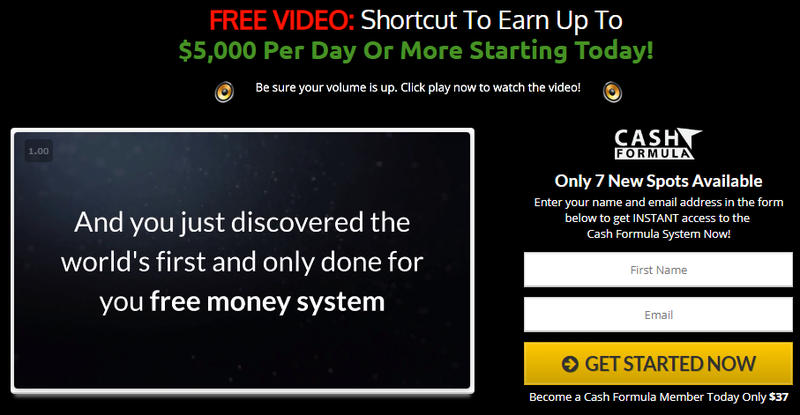 They claim that you can make as much as $5,000 in a day, and that you can start making this big money in just 30 minutes. Now, I know this is not going to happen. I do make money online, so I know what it takes to do this. It takes a lot of work, time and effort. It doesn’t happen overnight. That’s why I won’t be recommending this product. I’ve reviewed many others like this one that make the big claims of making huge amounts of money in a very short amount of time. They are get rich quick schemes that don’t work. Cash Formula is a done-for-you product. They claim everything is already done-for-you and all you have to do is sit back and push a button to riches. This is very misleading and not clear at all about how you will make all this money. It is an affiliate marketing product where you promote other people’s products. All the material is so vague that I know a newbie would never be able to figure it out. Another thing you should know about this product: when you pay the $37 that only get you into the members area. Once you are in the they start with a upsells. You need to purchase another thing to start using the system and the upsells keep coming. You could spend hundreds of dollars before you actually can use the full system. You will have to reach your own conclusion about this. What I can tell you is that all the testimonials are fake and even the owner is fake. You can see those same photos scattered around the internet promoting other products under different names. If this product were so good, don’t you know the owner would want to take all the credit for having such a great product and they wouldn’t need to use fake testimonials. They would have more real testimonials than they could list. You may not be able to completely list this as a scam though, because ClickBank does offer a money back guarantee. You also may even learn a few things with this product but it won’t be enough to make you much money. Don’t waste your time and money on Risky Business like this. There are some really great products out there that you can use to make money, that are not get rich quick schemes. They don’t make claims like you can make a lot of money quick. They train you to do exactly what is necessary to start making money online. They also offer you some great tools to help you get your online business on a path to success. So if you’re wondering, can I make money from affiliate marketing, the answer is yes. You can make money from affiliate marketing and lots of it, if you get the proper training. There is a lot to learn before you can start making money from affiliate marketing, but once you learn, it’s a great way to make a living. You can work from anywhere in the world you want to be, as long as you have an internet connection and your laptop. It allows you the freedom to travel, to work the hours you choose, and be your own boss. You can afford the luxury of working from the comfort of your own home and doing your job on your own terms. I’ve been making money every single month now for 13 months without missing a single month getting a paycheck but I wasn’t always successful. I failed many times before I discovered the platform that I now use to learn and make money. It gave me all the tools and training to get me going and help me build my successful online business. It also gave me a new attitude about my online business. I am now a proud owner of an online business, not just a pretty website. You can learn from the exact same place where I learned and get access to the same tools I used to achieve success. You can sign up for free and start the training as well as get a website up and running. There are not upsells or hype about getting rich quick. You progress through the training at your own pace and one day you start making money. It will start with a trickle and grow into a steady stream. You have a choice of two memberships. You start with a free membership. This will get you going with your training and get your website up and running and then when, or if, you’re ready, you can upgrade to the premium membership. You also get me as your personal coach as well as 1.7 million other members that are happy to help you if you need them. There is also 24/7 live chat support. If you’re serious about starting your own online business, this is the place to begin. Click the green button below to get started today for free.